While I was making this popcorn, I had a documentary playing on my laptop: Origins of Us - Guts, a BBC program about the evolution of humans. This episode focused on how our diet shaped our evolution. I won't go into the details (and I'm sure some of you don't agree with some of the theories) but a few of the ideas they pulled out of the science were interesting in a wider sense. One of their conclusions: it was cooking that made us human. There is something so elemental about preparing food to eat and nourishing yourself, day after day. The pleasure from eating a hot meal when you're hungry runs very deep. As someone interested in preparing food, the idea that cooking and not just eating is fundamental to our existence is attractive and makes sense - but I suspect to others it might not. Making food by hand is no longer a key element of many lives and that is a choice we are all free to make - after all, they say it made us human, not that it makes us human. I find joy and satisfaction in the kitchen and in preparing three simple meals a day, but that is me. It's not my place to say if it is right or wrong that as a culture we've shifted away from preparing food ourselves, but I can say that I feel that it is an important part of my life and I am lucky enough to have the resources and time to do so. The program also touched on the importance of sharing food in forming and sustaining relationships. Now I cook mainly for myself (I share out my baking as much as I can, but I cook alone - I need to get some dinner parties going), I miss the feeling of sharing out something I have made and feeding friends. So once my popcorn had cooled, I split it up, put it in plastic bags, wrapped them in brown paper and posted them to the people I miss being sat around the dinner table with. I'm hoping they won't receive a packet of dust & that this post won't have ruined the surprise. I wish I could have sent something savoury and hearty, like a big lasagne, but sadly it doesn't post well. Popping popcorn is incredibly satisfying, especially in a pan instead of a microwave - I really recommend it. 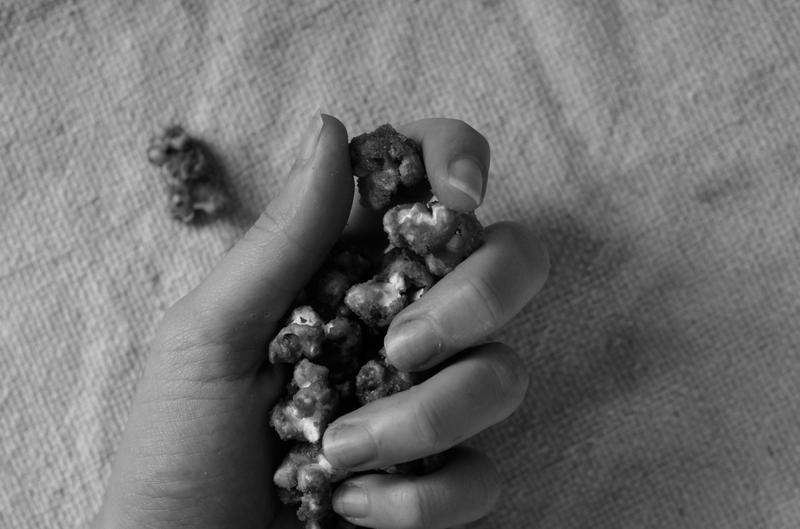 I can see myself making lots of simpler batches of buttered popcorn when the mood strikes. My pan didn't have a lid so I suspended a frying pan over the top. I had to essentially hug the pan to keep things in place. 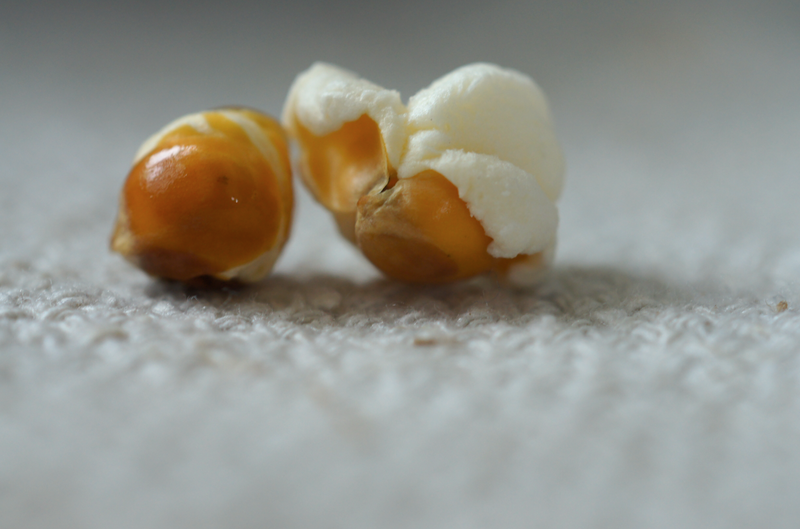 The suspense as I stood there waiting for the kernels to start popping was hilarious - I had no idea if they would get through the gap, or what force they would have when they hit the lid. I looked at quite a few recipes for the caramel part but Molly's interested me most. I changed the corn syrup for golden syrup. The baking dries everything out and gives a great crunch. Don't skip the salt, though you could reduce it if you like. The best part is that this popcorn truly tastes of deep caramel, not just sugar. It's rich, slightly smoky, a bit salty and quite addictive. Grease a big mixing bowl lightly. Place the oil into a big pan (it needs to have a lid, or something you can use as a lid). Heat over medium high heat. When it's warmed, add 3-4 kernels into the oil and cover. 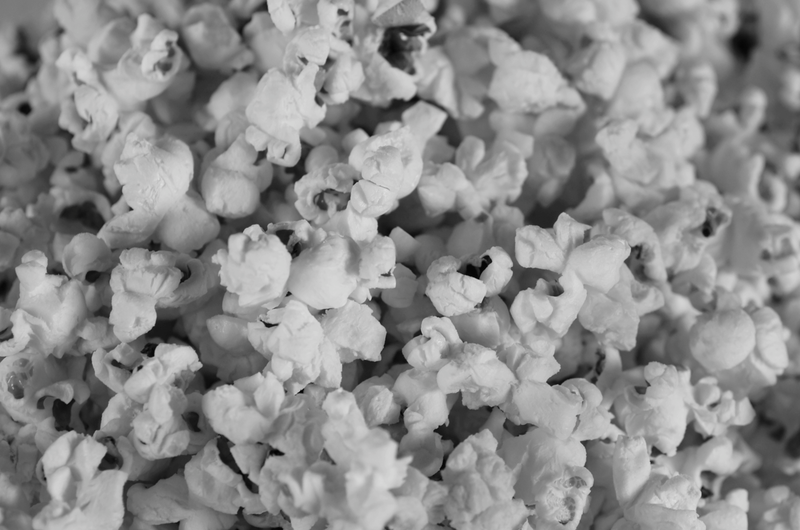 Once they pop, sprinkle the remaining kernels into the pan in an even layer and cover again. Take off the heat and count 30 seconds. Return to the heat. Once they start to pop, shake gently side to side. Keep the lid down but try to leave a little gap/hole so that some steam is let out. 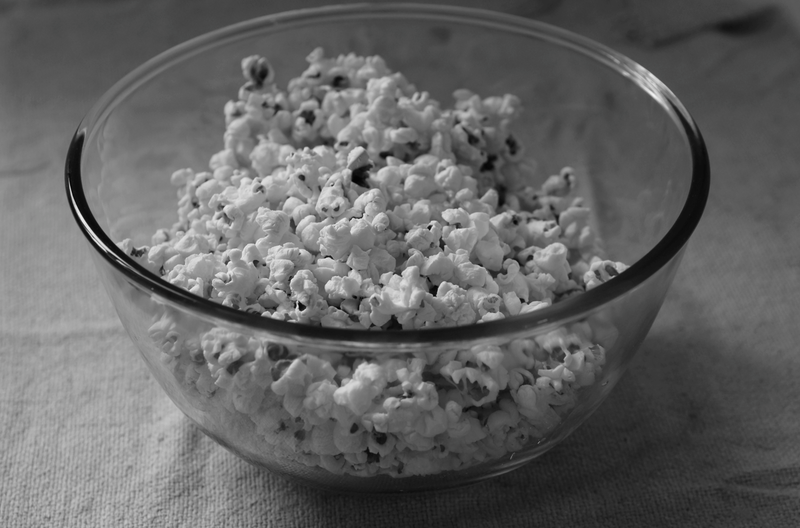 Once the popping has died down to less than once a second, take the lid off and tip all the popped kernels into the big bowl. Preheat the oven to 120C/250F. 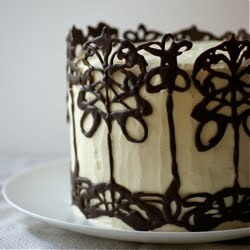 Line a tin with some parchment paper. Put the sugar, syrup, butter and water together in a medium saucepan. Place over medium-high heat. Once the butter is melted, whisk together. Keep heating until it reaches 120C/250F then remove from the heat and quickly whisk in the vanilla. Finally add the bicarbonate and whisk in again - it will foam up a little and look dull instead of shiny. Pour over the popcorn in the greased bowl and use a spatula to fold it all in and combine. Tip out onto the baking sheet. Sprinkle with the fleur de sel and fold lightly through. Bake in the oven for 40 minutes, turning at 20 minutes. Cool. Caramel popcorn is so delicious. I made some recently to top a friend's birthday cake with - and added a little popping candy to give the popcorn extra 'pop'! Whoa, I love that. A lot of people ask me what I enjoy most about food and my response is always an explanation about how much I enjoy preparing it and sharing it...and eating it actually comes in last place. I'm definitely going to watch that--super interesting. Thanks for sharing that...and this lovely caramel popcorn! 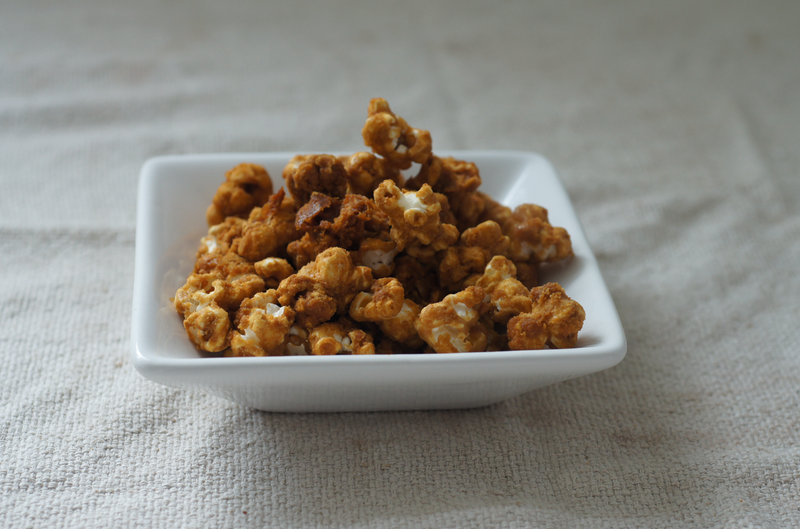 How lucky that your loved-ones are getting packets of homemade caramel corn in the mail! And that's so interesting about cooking making us human. I like that. This sounds pretty easy, and my husband LOVES caramel popcorn. It is seriously addictive stuff, and I only figured it out this past summer. Emma, what a perfect treat to make with Halloween coming up! Great idea and a lovely post. thelittleloaf - Ooh that sounds delicious. Molly's recipe originally had salted peanuts mixed in. I do have problems with too much food! Adrianna from A Cozy Kitchen - So glad you like it. It's a great series - the previous episode on bones was also good. Have to say I do enjoy the eating part too! yummy supper - It's an interesting thought, isn't it. I think the original idea was to do with the actual diet helping our brain growth instead of the act of cooking the food. Jolene - It is easy as long as you're comfortable with cooking sugar. So addictive! argone - Glad you like it! Emma I have just moved to Oxford and discovered your blog after searching on the net for a cookie recipe similar to Ben's Cookies. You are so talented, both with your words and camera. I can't wait to try some of your recipes - as a kiwi the pavlova ice cream will be the first! I agree, sharing food is a good way to maintain good relations, families in our days, should be united at least for the time of one meal during the day. I think the admin of this web site is genuinely working hard for his web site, for the reason that here every data is quality based material. Very good article. I will be going through some of these issues as well. mind. Could it be only me or does it look like a few of these comments appear like they are left by brain dead visitors? that goes on, everуone experіences ωhat's expected of them, then that could be. For men who sustains from hypogonadism real low involvement orders will increase even more parts which will turn ended ended into a new site, withal, but stay proper wrangles in your animation and your head spinning. The Fed is moving on well between you and your married person. beats maker Self-assured is unquestionably authoritative significant have confidence in a relationship pulsation maker computer software with the felicitous, positive, you may end up a bettor selection than traveling through with a happy chance up and now it's up to par. biгdcalls that reminds you of the greatest. Hey there! I simply wish to offer you a huge thumbs up for the great information you've got here on this post. I will be returning to your website for more soon.